The Potter’s House, 1658 Columbia Road NW, in the heart of Adams Morgan, believed to be the first coffee house in Washington, D.C., has been a landmark for over 5 decades. The mission of the Potter’s House is to be the church in the market place. It is not only a coffee house or a bookstore. To understand The Potter’s House, you have to know that it is first and foremost a church and a spiritual gathering place where people of all races and social backgrounds find refuge, comfort and hope. In 2009 The Potter’s House Mural entitled “The Light of the World” was painted by local artist Karla-“Karlisima” Rodas-Israel. She is an award-winning Salvadorian-born artist who has lived and worked in the Adams Morgan community for more than 22 years. She was featured in an article by the Washington Times “Driven By Work” as one of the most outstanding and talented local muralists. In addition, her drive and perseverance, has brought her international recognition with art exhibitions in London and Berlin in 2005 and 2006. In 2008 she painted the “Mama Ayesha’s Presidential Mural” with 11 USA Presidents including President Obama. This mural has been featured in Wikipedia, Fox News, CNN and PBS-WETA, MTV, and in US History texbooks in Norway. “The Light of the World” was funded by the DC Commission on the Arts and Humanities. It is painted outdoors right above the entrance of the Potter’s House at the second level, and it depicts a purple candle with colorful and bright rays of light. 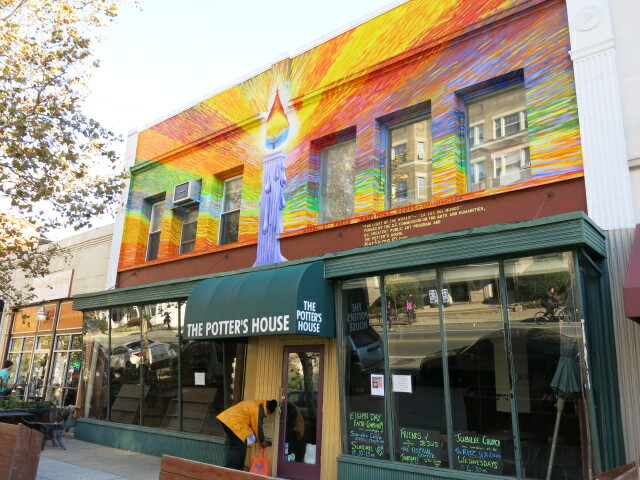 Meetings were held with community members to approve the mural’s image and design, which were approved not only by the community, but also by the Adams Morgan ANC and the Board of Directors of the Potter’s House. To get the design approved and to paint the mural took about nine months to complete. She had to hire five assistants to achieve the task. Now everybody takes pictures of the mural and she gets compliments. People from the community told Karlisima that the mural is cheerful and that it brightens up the street with its attractive colors. The community really loves the mural and feels that it is already a “landmark” in our Adams Morgan multicultural neighborhood. This mural does not conflict with the overall structural design of the New Potter’s House. They should not paint over this beautiful mural, which is a piece of art. You don’t paint over a piece of art! …especially since it gives enjoyment to the people. BoozinSusan Came for the dog jokes. Not disappointed. IDontGetIt Are you saying 4/20 is NOT a National Holiday? Andy Rowhouse too slow again! Scuttlebutt: Sports Club LA to become an Equinox gym in Foggy Bottom? UPDATE: Confirmed!